TwitMerlin.com is a new website that offers in-depth information as well as the latest news in the Xbox gaming industry. TwitMerlin.com is a new website that features the latest and complete data on the best video games for every gaming enthusiast of all ages. The statistics are telling: the video gaming industry is one that will thrive for years to come. In the United States alone, 65% of households have, and play using, computers and gaming consoles. As of 2007, the sales of U.S. computer and video game software rose by 6% to $9.5 billion, tripling industry software sales since 1996. While gaming seems to dominate a kid's world, the opposite may just be the truth. The average game player is a 35-year-old, while the most frequent game buyer is a 40-years-old who is expected to have a job and the money for purchasing. The rising gaming and game buying trends have led industry predictors to believe that by 2012, some 190 million households will be using a next-generation video game console. In the present and the next generations to come, the video games industry is not deemed to die down – and TwitMerlin.com will be there to deliver relevant information on the best video games. TwitMerlin.com is a new website that features the latest and complete data on the best video games for every gaming enthusiast of all ages. The website is created by gaming fans who enjoy sharing reports obtained from a host of other sources. Information categories at TwitMerlin.com include News, Featured Games, New Games, Indie Games, Kinect Games and Xbox live. 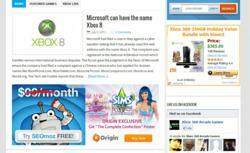 The website features everything from the gruesome video games to ever hit the market to video game releases and the latest Xbox 720 rumors. While home to thorough research and comprehensive information, TwitMerlin.com is not owned by, is not licensed by nor is a subsidiary of Microsoft Corporation, Xbox 360 and Kinect. The website clarifies that its content is not supplied or reviewed by Microsoft, and that all articles, images, logos and trademarks are property of their respective owners. To know more about best video games facts and news, please visit http://www.twitmerlin.com for information. TwitMerlin.com is home to the latest and most comprehensive information on video games. Targeting gaming fans and enthusiasts, the website also provides gaming and device insights.